LANSING — A former head coach of Michigan State’s gymnastics team was charged Thursday with lying to an investigator when she denied that witnesses told her years ago about being sexually assaulted by ex-sports doctor Larry Nassar. A charging document does not specify how many witnesses allegedly reported Nassar to Kathie Ann Klages, or when they did so. But former gymnast Larissa Boyce has said she told Klages of Nassar’s abuse in 1997, when Boyce was 16 — 19 years before he was first criminally charged with sexual abuse. Klages, who resigned in 2017 after she was suspended for defending the now-imprisoned Nassar, is now the third person other than Nassar to face criminal charges related to his serial molestation of young female athletes under the guise of treatment. Numerous other people have lost their jobs or been sued. If convicted of lying to a peace officer, the 63-year-old Klages could face up to four years in prison. 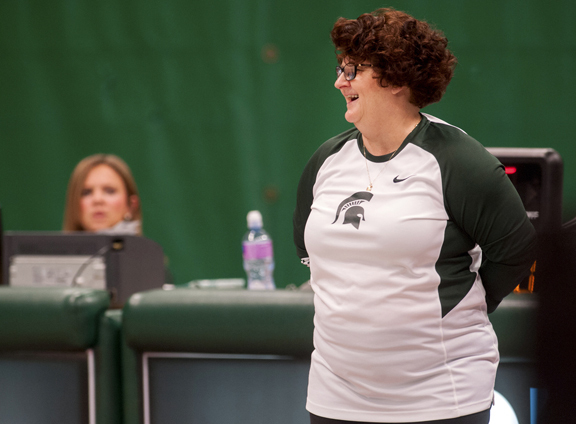 Boyce, who declined comment Thursday, had been training with the Spartan youth gymnastics team in 1997. She has said Klages dissuaded her from taking the issue further, even after another teen gymnast relayed similar allegations. The warrant released Thursday alleges that in June, after being informed by special agent David Dwyre that he was conducting a criminal investigation, Klages knowingly and willfully made false and misleading statements to him. She faces two counts of lying to a peace officer, one a felony and the other a high court misdemeanor. It was unclear whether Klages had a criminal defense attorney.